OSU-03012 (AR-12) is a potent inhibitor of recombinant PDK-1(phosphoinositide-dependent kinase 1) with IC50 of 5 μM in a cell-free assay and 2-fold increase in potency over OSU-02067. Serum-deprived HEK293-AT1A cells were pretreated with PD98059 (20 uM; 1 h) or OSU03012 (10 uM; 6 h) prior to 5 min stimulation with AngII (100 nm) or SII (50 uM). A, abundance of phospho-Akt T308 in whole cell detergent lysates. Representative phospho-Akt and total Akt immunoblots are shown above a bar graph depicting the mean ?S.E. of three biological replicates. BX912 is a potent and specific PDK1 inhibitor with IC50 of 12 nM, 9- and 105- fold greater selectivity for PDK1 than PKA and PKC in cell-free assays, respectively. In comparison to GSK3β, selectivity for PDK1 is 600-fold. Inhibition of PDK1 or MEK1/2 abrogated Erk1/2 phosphorylation. 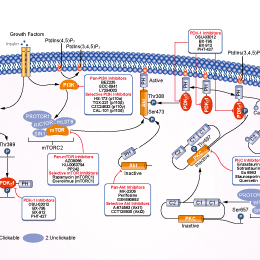 Cells were treated with pharmacological inhibitors of Raf (AZ 628, PLX4032), MEK1/2 (AZD6244), p90RSK (BI-D1870), PI3Kδ (X-370), PDK1 (BX-912), Akt (MK-2206), mTOR (AZD8055) or mTORC1 (Rapamycin) respectively and indicated proteins were detected. GSK2334470 is a novel PDK1 inhibitor with IC50 of ~10 nM in a cell-free assay, with no activity at other close related AGC-kinases. (G) Effect of the PDK1 inhibitor GSK2334470 on MYC and P70 phosphorylation in CNE2/235 cell line by immunoblotting analysis. (H) Sensitivity to GSK2334470 in CNE2/235 cells after treatment with GSK2334470 for 5 d using the MTT assay. (I) Inhibitory effect of GSK2334470 in combination with BEZ235 on cell proliferation in CNE2/235 cells using the MTT assay. (J) IC50 values of BEZ235 with or without GSK2334470 in CNE2 and CNE2/235 cell lines. The data shown are representative of 3 individual experiments.